A/N: I just want to say this and it will be explained later in the story Lizzie is not a normal vampire, she needs to breath, she gets sick, she gets cold, she dosen&apos;t heal as quickly as regular vampires, shes not as strong or fast and her heart beats. Stefan woke me up at 7:30 and I was pissed. I wined and snuggled into Damon. "Eli youre gonna go to school with me." I pretended to be asleep. "Eli, I know your not asleep." "I am to!! Uh I mean....... snoooorrree." 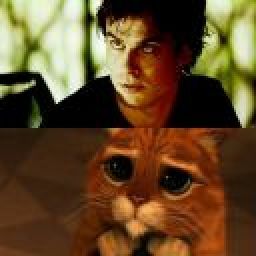 I snuggled further into Damon. "Ok then if your asleep i&apos;ll just leave......" I snickered and tryed to go back to sleep. Then I was lifted from Damons chest. "WHAT THE HELL IS GOING ON!?" Damon screamed sitting up. I pushed myself away from Stefan and ran to Damon. "Stefans trying to make me go to school." Damon sighed. "NO!!" I sat in his lap. "Please Dami, Steffy, I&apos;ve already learned everything!!" "Ok then, i&apos;ll make you a deal. We&apos;ll put you one year below me. Sophomore year, and say you skiped a grade." Stefan said. "I&apos;ll pick you up right after school and take you to get an Iphone." "SCHOOL TIME!!" I screamed and ran to my room. I threw on my black skinny jeans, neon blue vans, a neon green v-neck and my gir hoodie with ears. I looked around my room and relized something. "STEFAN!! I NEED A BACKPACK!! TAKE ME TO HOTTOPIC!!" In a flash he was infront of me. He held up a peinguin backpack from hottopic. I grabed it and looked inside. It was was full of school suplies, and even had a binder with the clear slip so I could put my own design in it. "You anticipated this moment didn&apos;t you?" "Thats nice....... ONWARD!!" I jumped on his back. "Giddy up horsey!!" He ran down the stairs making airplane noises. I hit his head. "NO!! YOUR A HORSEY NOT AN AIRPLANE!!!" "NEIGHHHH!!!!!!!!" I heared Damon laughing. Stefan got my sceduale and I was now going to first period. I ran off to my Geometrey and ran into someone on the way. We both fell on our butts. "I&apos;m so sorry." He said getting up. "Don&apos;t be. I wasen&apos;t watching where I was going." He helped me up. "Im Elizabeth Salvatore."